Early childhood is the prime time to establish healthy lifestyle. It is essential to integrate oral hygiene into general health habits of children from the beginning so they are conscious of their dental care. Although dental professionals recommend the adoption of oral cleaning habits among children, they seldom get to have general check-up of children under five until the child develops some disease or dental issue. Tooth decay is commonly increasing in Australian children as more than half of 6 years old are having tooth decay in baby teeth or adult teeth. Tooth decay not only destroys a tooth but also causes crowding problems in adult teeth at a later stage. Thus, it is vital to care for your child’s teeth from as early as they start teething. Parents should adopt cleaning measures from an early age to prevent any infection, cavities and pain. Parents need to implement a few important measures to ensure child oral health and hygiene. People usually do not give much attention to children when they are teething. It is the best time to start caring for your child’s teeth. There are soft-bristled brushes available for babies and fluoride toothpaste for children from 0-3 is available over the counter. Thus, it becomes much easier for parents to assist their child in start brushing its teeth until they reach the age of 7. Also, start finding the best child dentist for your child as soon as teething starts, to develop the habit among young children. Brushing teeth twice a day with circular motions. Praise your child for brushing teeth itself as it will instil confidence in the child. Replace toothbrush of your child every 3 months. Involve them in choosing their favourite character tooth brush as it would develop their interest in brushing. Supervise them in flossing until they are 10 and demonstrate the process yourself. It is equally essential for children to visit a dentist regularly to ensure healthy teeth growth. There are child dentists that are specially allocated for children. These dentists can diagnose your child’s oral health problems at an early stage and even recommend pain free Dentist treatment. Even if you have missed your children’s early oral care and realised it later, there are ways to treat your children with latest techniques. Dentists utilize various painless treatments such as laughing gas sedation, IV sedation, Sleep dentist, dental implant, invisible aligner, braces, invisible braces, sports braces and other such latest techniques. The main aim is to make regular visits a part of your overall health maintenance. It is important to make children realize the importance of visiting a dentist on regular basis. Parents should make dental visit a positive experience by motivating the child to keep its teeth clean. You can arrange a visit in holidays as there are dentists open in school holidays as an encouragement to parents to bring their children. Parents should keep an eye on their child’s eating habits. They should develop a balanced diet of fruits, vegetables, meats and dry fruits to ensure healthy teeth of children. If your child has a good diet from the beginning along with regular dental checkups, it would not need to visit a dentist for emergency. Minimize the sugar in-take in children especially lollies and juices as they can easily cause damage to the tooth of a child; and give fluoridated tap water. Also, try to avoid giving fast-food very often to children as it also has the tendency to build cavity and plague in teeth. 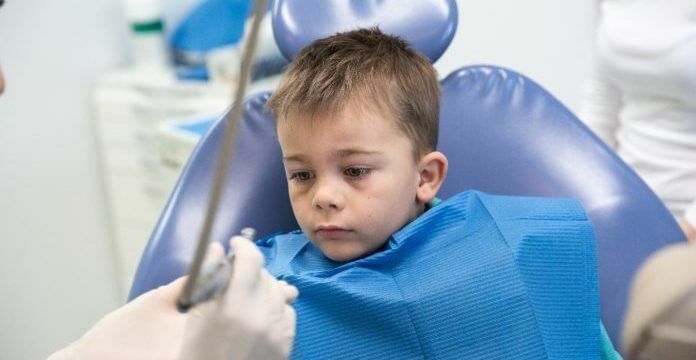 The Australian Government offers dental cover for some children through Medicare. You can check your child’s eligibility through Child Dental Benefits Schedule (CDBS). The Government has been continuously improving the dental support services to ensure that all children especially underprivileged children can have access to dental checkups. There are different types of financial support programs offered to the families by the Government. Some people prefer to choose private insurance which can pay most of their dental costs while the others who stay with Government sponsored Medicare can avail a Bulk Bill Child Dentist. You can also look for dental checkups that are provided at schools and public shopping centers to spread awareness among children and encourage them for oral cleanliness. It is important to have a routine of your dental appointments as it enhances the importance of oral health care among children. Children will know the schedule and would consider it a normal practice to pay a visit to the dentist. Plan your visit around weekends and find a dentist open on Saturday and Sunday. Otherwise, you can also schedule a time during weekdays if it suits your schedule and get appointments from a dentist open 7 days a week. Sometimes it becomes difficult to keep a family dentist as you move from one suburb to another. However, now many dentists cover more than one suburb and have dental clinics that cover surrounding areas as well. Hence it is much easier to visit a dentist if you live in Blacktown as it would cover areas of Blacktown, Kellyville, Penrith, Bella vista, Castle Hill, Parramatta, Quaker Hills, Seven Hills, Baulkham Hills, Glenwood, Rooty Hills, Marsden park, Stanhope Gardens, Westmead, Windsor, Richmond, Toongabbie, Liverpool, Denham court, Leppington, Gregory Hills, Edmondson Park, Gledswood Hills, Oran Park, Harrington Park, Austral, Raby, Kearns, West Hoxton, Hoxton Park, Carnes Hill, Horningsea Park, and Prestons. People should realize the importance of oral care among children from an early age. Oral diseases are developed as a result of carelessness in dental care and eating disorders which requires emergency dental visits which might frighten the children. Hence, elders should become role models for their children in keeping their teeth clean and healthy. It encourages them to adopt dental care habits at an early stage to have strong and healthy teeth which leads to a beautiful smile forever.